May Bushell of the 'Bull'. 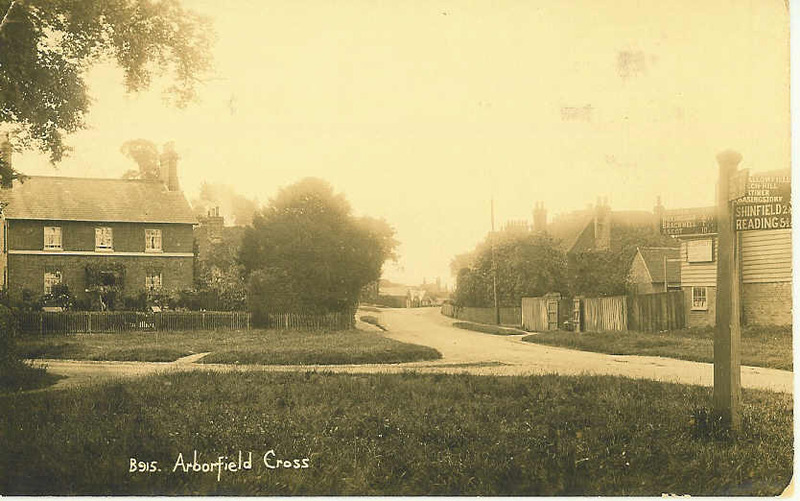 Mrs. Hargreaves also hosted the last big social event in Arborfield before the declaration of war - see here. Widespread regret was expressed in Berkshire, and particularly in Arborfield and the district, when it became known that Mrs. Sarah Hargreaves, of Arborfield Hall, passed away at her residence on Saturday. The deceased lady had been in failing health for some time. She spent the winter at Bournemouth and returned to Arborfield Hall about a fortnight ago. Her condition became worse, and she gradually sank. Her end was not unexpected. Aged 84, Mrs. Hargreaves was the daughter of Mr. Washington Jackson, Ballybay, co. Monaghan, Ireland, her mother being Annie Maria Dawson, a descendant of Mr. George Pelsant Dawson, of Osgoodby Hall, Yorkshire, and Arborfield Hall. 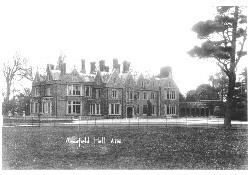 She married Mr. Thomas Hargreaves, J.P., of Arborfield Hall and The Mount, Bishopstoke, hon. lieutenant in the Royal Naval Reserve, who predeceased her on September 28th, 1891. Mrs. Hargreaves has resided at Arborfield Hall for upwards of sixty years, coming there as a bride, and is a descendant of the Dawsons who formerly owned the Hall. The Dawsons were a very old and historic family, and quite a number of its members rest in the old churchyard, and in the church are several monuments to their memory. Here also is a window given by Mrs. Hargreaves in memory of her father-in-law. The church was erected in 1863, at a cost of upwards of £4,000. Mrs. Hargreaves' uncle, the late Sir William Brown, Bart., of Liverpool, being the principal contributor. The living is in the gift of Mrs. Hargreaves herself. The rector at that time was Sir John Hayes, who, by the way, was father-in-law to Mr. John Simonds. The old church, built nearly 700 years ago, stands in the grounds of Arborfield Hall, and is in ruins. It is certain that within living memory no one has done more for the parish than Mrs. Hargreaves. The extent of her benefactions will never be known. She was a most generous supporter of all charities, and to the poor was a true friend. She was always ready to lend a helping hand to any deserving case, and no appeal was ever made to her in vain. The welfare of the children also found a warm place in her heart, and many who have now grown into manhood and womanhood will never forget the advice and kindly help which the deceased lady gave them. Mrs. Hargreaves loved the parish church, which she has so regularly attended over so long a period of years, and helped most beautifully. She liked a bright service, but no [illegible]. She could claim the proud record of being the oldest member of the congregation, and in every branch of church work she evinced the liveliest interest. The organ was her gift and for some years she shared with Mrs. John Simonds the duties of organist. Incidentally, it might be mentioned that the deceased lady was looking forward to entertaining the Bishop of Oxford on the occasion of the confirmation next week. 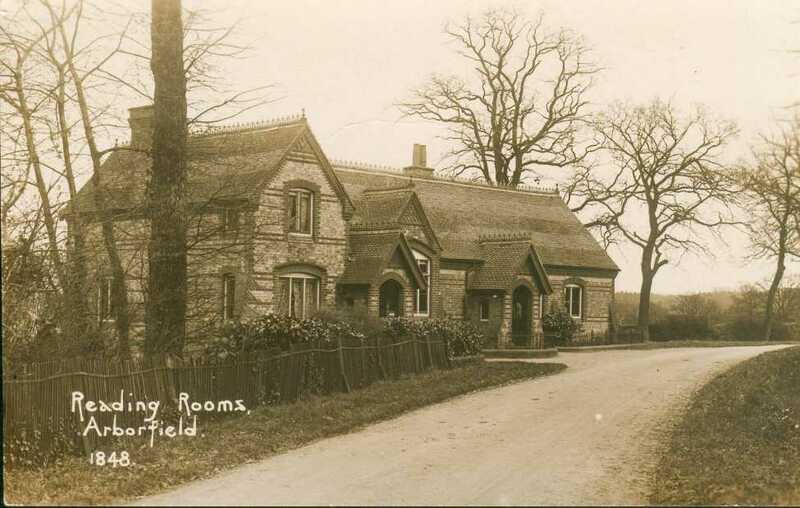 To perpetuate the memory of her eldest son, Mrs. Hargreaves provided a reading-room near the church. At the commencement of the war she gave a miniature shooting-range, and was a liberal supporter of the village cricket club, in whose doings she took a deep interest. Her park has also on many occasions been thrown open for the local cottagers’ flower show. Mrs. Hargreaves, who in her earlier days took a prominent part in county life, leaves six children – one son and five daughters. Two have predeceased her – one son and one daughter – the latter being Viscountess Exmouth. Her surviving son is Mr. John R. Hargreaves , of Drinkstone Park, Bury St. Edmunds, and her daughters are Lady Erskine, Mrs. Wollaston of Shenton Hall, Warwickshire, Mrs. Hippisley, of Sparsholt Manor; Mrs. King, wife of General King, of London; and Mrs. Ratcliffe, of London. It may be mentioned that Mrs. Hargreaves was sister-in-law to Mr. John Hargreaves, late of Maiden Erlegh Park. The funeral took place at Arborfield Church on Wednesday, when a large number of the parishioners and others attended. The service, which was simplicity itself, and yet of a very impressive character, was conducted by the Rector (the Rev. J. A. Anderson) and the Rector of Barkham (the Rev. P. H. Ditchfield). Mr. Ditchfield read the lesson and the Rector of the parish took the other portion of the service, including the committal. The coffin was drawn by some of the employees, who also acted as bearers, on a bier which had been presented to the parish in memory of Mr. Arthur Hargreaves, October, 1878. The hymns, by her own request, were “Nearer, my God, to Thee” and “Jesu, the very thought of Thee”. Mr. Allen was at the organ. The interment was in the family vault, where, and in adjoining vaults, rest several members of the Hargreaves family. The mourners were Mr. John Hargreaves (son), Mrs. Ratcliffe (daughter), Mrs. Hippisley (daughter), Viscount Exmouth (son-in-law), Mrs. Crosland (granddaughter), Mrs. and Miss McCoy (cousins), and Nurse MacLennan. Amongst those who attended were General Lord Basing, Captain the Hon. Selater-Booth, Mr. John Simonds (churchwarden), Miss Beatrice Simonds, Miss Alice Simonds, Mrs. Alfred Palmer, Mr. and Mrs. A. B. Cobham, Mrs. George B. Tyser (Mortimer), Mr. and Mrs. Vere Allfrey, Miss M. Cobham, Mrs. Anderson, Mrs. Ditchfield, Mr. E. M. Sturges, Mrs. Stuart Rickman, Mr. Kenneth Prescott (Arborfield Court), Mr. F. W. Seymour (churchwarden), Mrs. Seymour, Mr. W. Gray, Mr. G. H. Newman, Mr. E. Taylor, Mr. and Mrs. Kersley (Hall Farm), Mr. and Mrs. S. H. Phillis, and many villagers. In the course of his sermons on Sunday the Rector (the Rev. J. A. Anderson) referred to the death of Mrs. Hargreaves. He spoke of her as one of Arborfield’s greatest lovers and largest benefactors, and one who had been a most true and kind friend to himself and to very many others. She was a woman gifted with a strong will, a great determination, and a real sense of duty. She had a simple faith, a true knowledge of fellowship with God and with His Son Jesus Christ, maintained by prayer and Bible reading, and she had taken a deep interest in the welfare and happiness of those around her. In some ways Mrs. Hargreaves might be compared to one described as a mother in Israel who was constantly urging others to action, insistent on getting her will done, and rejoicing in the success of her people. She loved to mother others, children and adults, to make them happy; and she was ever ready to comfort those in sorrow. Full of activity, she was always trying to do something for somebody. For some sixty years she had lived in the place and sought its welfare. 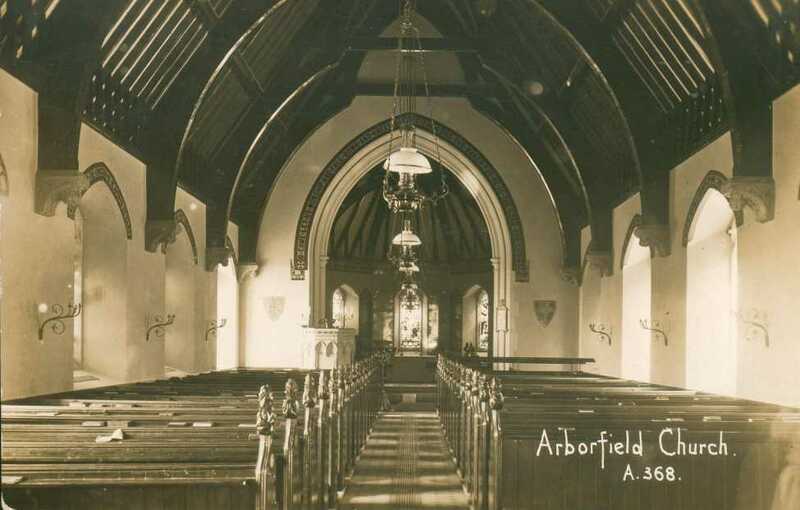 During those years she had striven to do whatever she thought best for Arborfield and for its church. Her departure to be with Christ left them much to carry on, and her life lived amongst them left them much for which they had to thank God and which they might well seek to imitate. The Garretts' building business is shown in the detail from a postcard, shown right. The yearly outing of the boys, girls, and infants attending the Arborfield Schools was celebrated on Friday in last week. 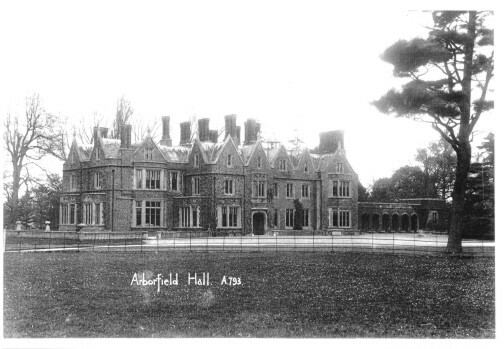 The treat was kindly given by Mrs. Hargreaves, of Arborfield Hall, who placed an ample space in her grounds at the disposal of the teachers and others for the occasion. The fete proved a successful one in every way. The rendezvous in the first place was the schoolhouse, where the children, to the number of 130, assembled in charge of Mr. Webster (schoolmaster), with Mrs. Webster, Miss Turner, and other teachers. A procession was formed, and, headed by a band, proceeded to the park, where preparations were already made for the reception and enjoyment of the children. Mrs. Hargreaves bid them all welcome, and with the help of Miss Hargreaves and Miss Ella Hargreaves, exerted herself in a variety of ways throughout the proceedings to make one and all as thoroughly happy as possible. To this end too, the Rev. W. A. Williamson also contributed, superintending and helping. Among others present, who also helped, were Mrs. Jones, Miss Clara Jones, Miss Simonds, and Miss Beatrice Simonds. The children were kept busy with a succession of games; races were run, and the swings were incessantly patronised. A substantial tea was partaken of, and afterwards Mrs. Hargreaves gave to all the children beautiful and useful presents, most of which had been brought from abroad. 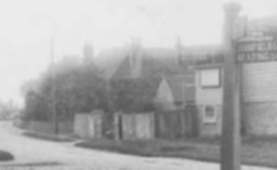 More sports, racing, &c., occupied the time till past six o'clock when preparations were made for a return home, but the journey was not commenced before three cheers had been given for Mrs. Hargreaves, and each child had been given a piece of cake. Later in the evening, Mrs. Hargreaves gave a "harvest home" to all the workmen on the estate, which was prolonged until about 2 o'clock in the morning. Through the kindness of Capt. and Mrs. Rickman, of the Grange, the children of the parish were entertained at the room near the church. A good tea was provided, to which ample justice was done. The Misses Simonds afterwards kindly exhibited a Magic Lantern for their amusement. Each child received a present from Mrs. Rickman, who seemed indefatigable in her efforts to please the children, all of whom went home with very happy faces.